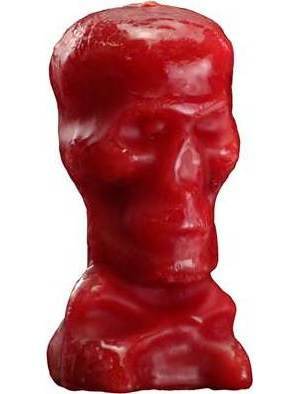 Shop > Magic Candles > Figure candles > Red Skull Candle 5"
This wax effigy of a human skull is red, stands approximately 5 and 1/2 inches tall while the base is 2 and 3/4 inches by 2 and 1/2 inches. Skull candles are utilized specifically to influence a person's mind and a red one may be incorporated into a variety of magical castings associated with love, lust, passion, courage, strength, and competition. When utilizing human skull candles it is suggested to baptize or name the effigy, an example of this would be; carving the person's name whom the spell or ritual is for into the base of the candle. Symbols associated with the end result may be carved into the candle as well and the figure candle may be anointed with oils that correspond with the intentions of the casting. Rated 3 out of 5 from 1 reviews. Doesn't burn evenly, and leaves a rather large pool of wax. If you use this candle, you must take extra care, in created a fire-proof area.